Lanseria Airport is one of two airports in Johannesburg which cater for passengers on commercial airlines - the other is OR Tambo International Airport. Although fewer airlines fly to Lanseria Airport than OR Tambo International Airport, it is closer to the Sandton, Pretoria, Westrand and Midrand regions of Johannesburg. Unlike most commercial airports in South Africa which are run by the Airports Company South Africa (ACSA), Lanseria Airport is privately owned. The airport has 2 runways. The airport's ICAO code is FALA & IATA code is HLA. 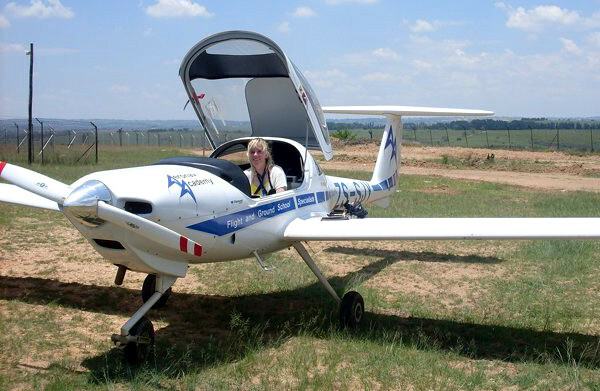 Aeronav Academy offers flight training from Lanseria Airport, in its Diamond DA20 eclipses. (7) At the 3-way stop turn right into the Airport Entrance Road. 2014-02-13 A light plane landed at Lanseria airport without wheels after its undercarriage failed. The airport was closed for a short while. 3 Feb 2014 : PLANE CRASH just before 07h00 : A twin-engined Beechcraft Baron 58 plane has crash-landed in severe, heavy rain at Lanseria Airport, with 3 people on board (2 pilots, 1 passenger) - all deceased (initial reports were incorrect that there were 21 on board). The names of the souls on board, and the private owner of the plane, have not yet been released. 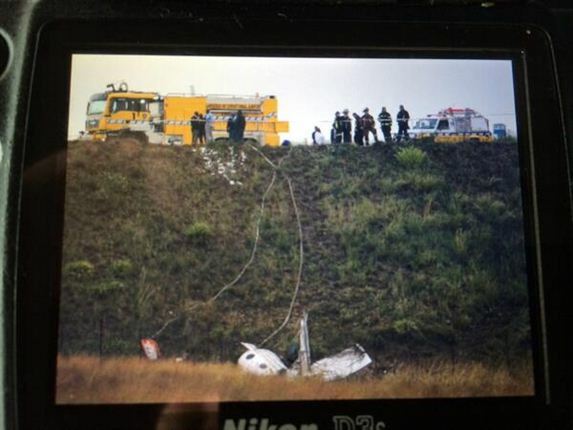 South Africa's Civil Aviation Authority plane to conduct an investigation. The plane took off from Rand Airport, and then something went wrong and it tried to land at Lanseria. 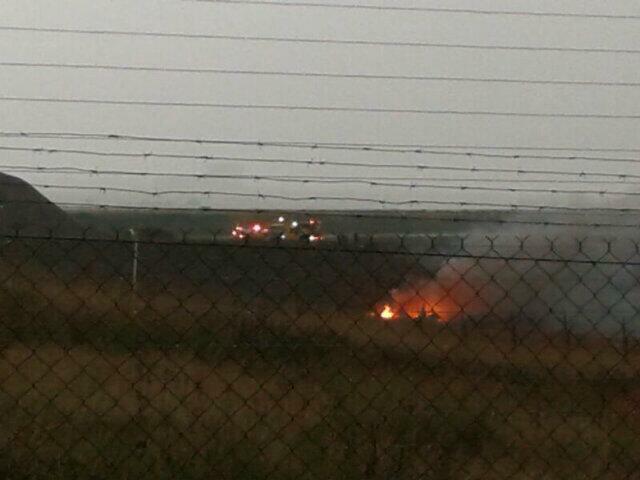 Eye witnesses have said there was smoke billowing from the plane before it crashed. The aircraft went up in flames after crashing. Emergency vehicles quickly made their way to the scene, but there was nothing they could do. They were joined by a few cars which parked on the side of the road, with those in the vehicle staring across the veld at the scene, which was cordoned off. All flights were initially diverted, however by 08h50 the airport was fully operational again. The crash was far from hangers, the runway & anybody on the ground. "Our deepest condolences to the loved ones of those who died in this tragedy. May God give them strength", said Rob Baker, Chief Executive of South Africa Travel Online. 11 Nov 2013. A new runway is opened at Lanseria Airport, which will allow larger planes to land. “The new runway and continued investment into Lanseria indicates its growing importance as a major secondary airport in Gauteng. In terms of increased frequencies or network additions ex Lanseria, these are dictated by market demand. Mango continually evaluates its network, new opportunities and growth potential across the country,” said Mango Airline's Hein Kaiser. 30 Sep 2013. A captain of a flight complains about Lydia Leotlela wearing an Economic Freedom Front beret whilst checking in passengers, and she later writes a letter of apology, but still receives a final written warning. 30 May 2013. The Competition Tribunal has approved the purchase of Lanseria Airport by Holdco, a BEE company. Holdco is buying 100% of Execujet & 50% of the airport, with Execujet owning the other 50% of Lanseria Airport. Holdco is owned by the Pan African Infrastructure Development Fund, the PIC & an empowerment consortium. The tribunal was concerned that ACSA, which owns OR Tambo International Airport, is part-owned by the PIC. One of the conditions of the purchase is that the PIC may not appoint any directors to the board of Lanseria Airport, who are also directors of ACSA. Lady Gaga arrives at Lanseria Airport to greet her "little monsters". It is announced that Lanseria Airport has been sold to a consortium of investors, including a BEE consortium which included; the PIC (Public Investment Corporation) and Nozala (a female empowerment organisation). One of the new owners, Harith, said that "A group of private investors who have owned and developed the Lanseria International Airport over the past 21 years have sold 100 percent of their shares in the airport...This is a landmark transaction for private sector infrastructure...We are very pleased to have been involved with the financing of this very important growth project and envisage that it will continue to foster regional interaction and convenience for the region, the rest of Africa, as well as the local business and tourism sectors." The transaction is subject to regulatory approval. Lanseria International Airport is evacuated after a bag is left unattended. The West Rand Explosives Unit is called in, and the bag is found to contain cigarettes, dates, business cards & a mysterious 500g bag of white powder. Three flights were delayed whilst the airport was closed for 4 hours. 1time quits flying from Lanseria Airport to concentrate on their African projects. 1time commences flights from Lanseria to Cape Town and Durban. Comair British Airways ends flights between George and Lanseria. Comair BA commences flights from Lanseria to George. Mango Airlines starts operating flights between Lanseria and Cape Town. "Lanseria Airport 1993" obtains a High Court default judgment against Daniel Nell after his company repeatedly failed to secure the R640-million purchase of Lanseria Airport. "There was a transaction on the table a few years ago for the sale of the airport. Due to non-compliance with the suspensive conditions, the sale never materialised. Even though the airport is not actively marketed for sale, there is continued interest ... and it will be for sale if the right transaction materialises." said Lanseria attorney Carel le Roux. First Car Rental opens an office at Lanseria Airport. Kulula scraps its flights between Lanseria and Port Elizabeth. SIA Solutions implements an AWOS (automated weather observation system) at Lanseria Airport, thereby improving the airport's safety rating. Tellumat has a 60% stake in SIA Solutions and Harambe Technologies 40%. Lanseria Airport's co-owners, the Krugersdorp and Roodepoort municipalities, sell it to a consortium of private investors. After being released from prison in Cape Town, Nelson Mandela is flown to Johannesburg via Lanseria Airport. Lanseria Airport is chosen to host Air Africa International, a major air show on the international aerospace calendar. The Lanseria Airport facility is opened to air traffic by Hannes Rall, then minister of transport, with a Learjet ZS MTD being the first plane to land at the new facility. Fanie Haacke and Abe Sher (both pilots) present a proposal to Hannes Rall, the acting minister of transport, for an airport to the north-west of Johannesburg. Rall replies "Wanneer lanseer ons dit", and the name Lanseria is born. Lanseria Airport is launched by Fanie Haacke and Abe Sher (both pilots fro Pretoria). In September 2009, the City Lodge Hotel Group confirmed that it had purchased land in Cradle City Business Park (near Lanseria Airport), with the intention of developing a hotel. With O.R. Tambo and Lanseria International Airport nearby, the skies over Johannesburg can get pretty crowded. Many thanks to Flightradar24.com for allowing us to show this map. From Lanseria Airport, Kulula operates flights to Cape Town and Durban. Flights from and to Lanseria are often cheaper than to O.R. Tambo International Airport. "Lanseria Airport 1993" is the owner of the airport's licences, intellectual property and assets. To get from Lanseria Airport to O.R. Tambo International Airport take a shuttle or taxi to Sandton, and then take the Gautrain to O.R. Tambo.